Abcam’s IL-1α Human in vitro ELISA Set is designed for the quantitative measurement of IL-1α in cell culture supernatants, buffered solutions, serum, plasma and other body fluids. 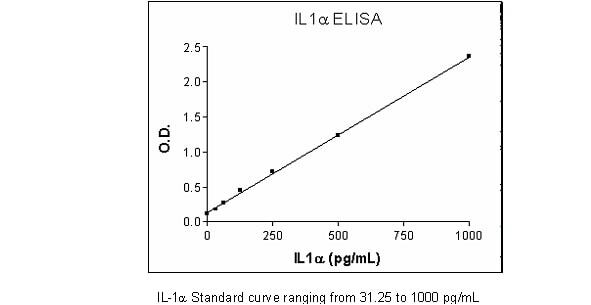 This ELISA set is intended to measure human IL-1 alpha in cell -culture supernatants, as well as in serum and plasma samples. The enclosed procedures provide general guidelines for ELISA preparation. This procedure may need some optimization depending on the plastic, matrix, standard range. The IL-1 alpha ELISA set includes both the capture and the detection antibodies as well as Horse-Radish peroxidase conjugated Streptavidin (HRP-Strep) and TMB which are the reagents used in the colour development step. Recognizes both natural and recombinant human IL-1a. IL-1 is a member of the interleukin 1 cytokine family. This cytokine is a pleiotropic cytokine involved in various immune responses, inflammatory processes, and hematopoiesis. This cytokine is produced by monocytes and macrophages as a proprotein, which is proteolytically processed and released in response to cell injury, and thus induces apoptosis. This gene and eight other interleukin 1 family genes form a cytokine gene cluster on chromosome 2. It has been suggested that the polymorphism of these genes is associated with rheumatoid arthritis and Alzheimer's disease. Our Abpromise guarantee covers the use of ab47350 in the following tested applications. ab47350 has not yet been referenced specifically in any publications. Publishing research using ab47350? Please let us know so that we can cite the reference in this datasheet. There are currently no Customer reviews or Questions for ab47350.